It's glitter time! 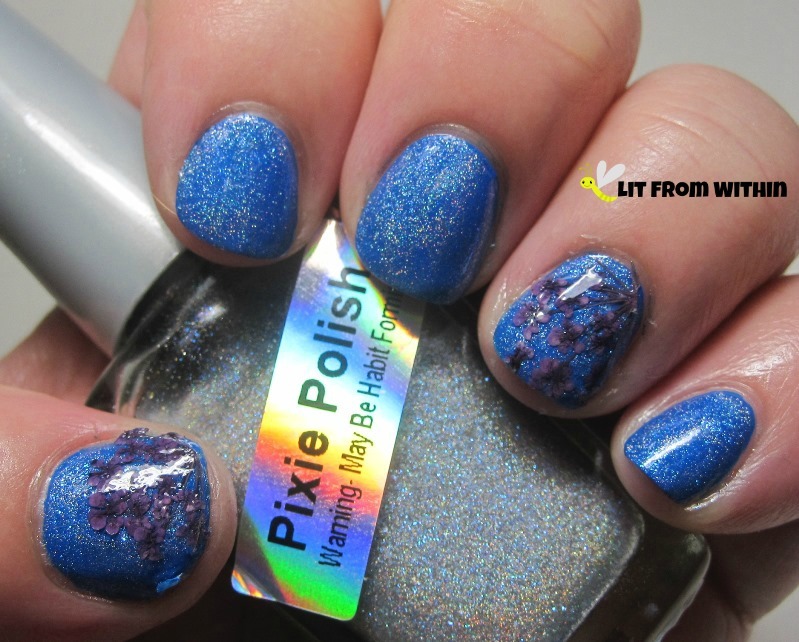 When Pixie Polish shut her doors, I nabbed a last few bottles of some of my faves, and I want to share one of the glitters with you today. 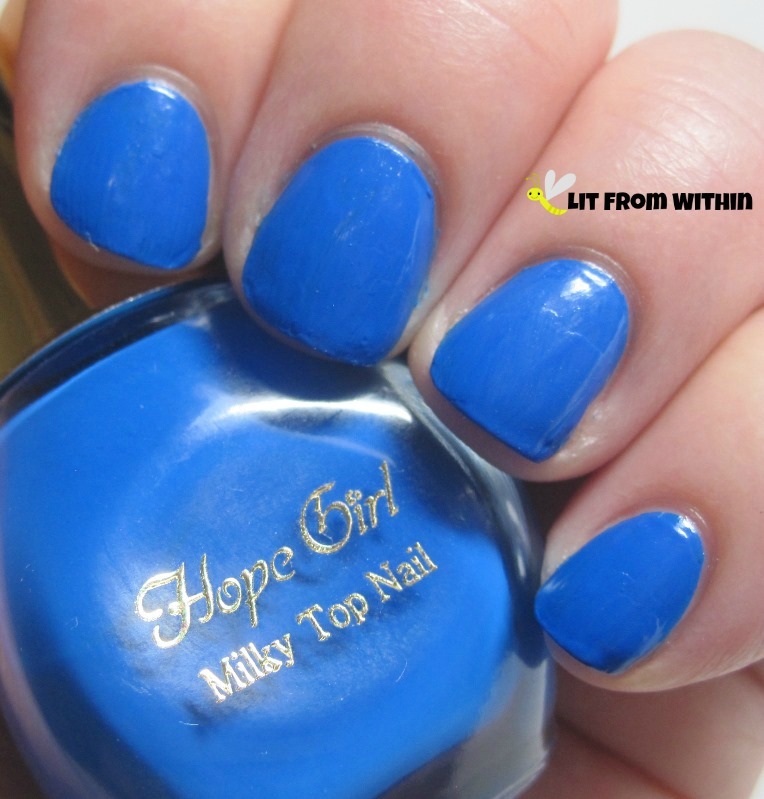 First, I started with a beautiful bright blue that I got in my Blue Memebox - Hope Girl BL03. It dried rather quickly to a satin finish. 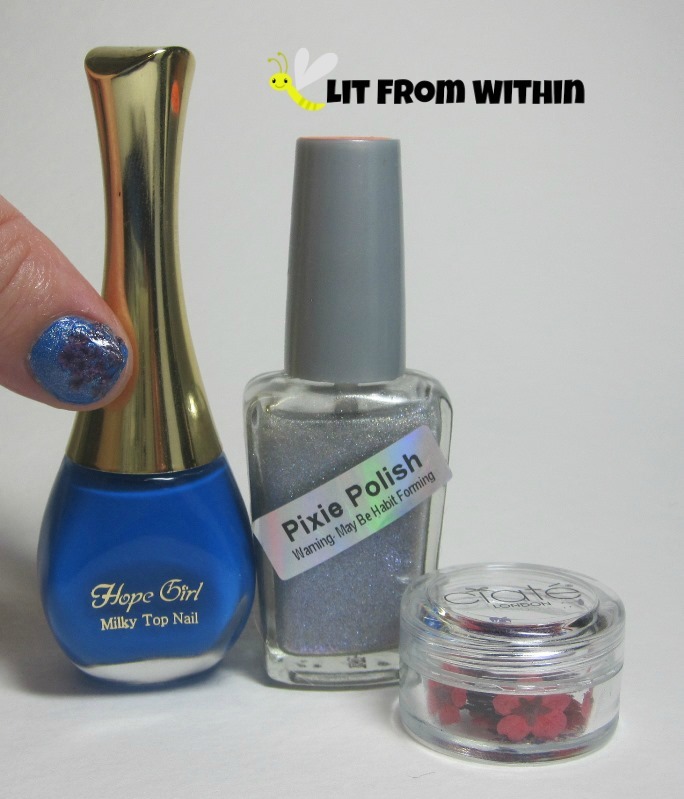 Pixie Polish Disco Peacock is a holo glitter topper with rainbow flecks in it. 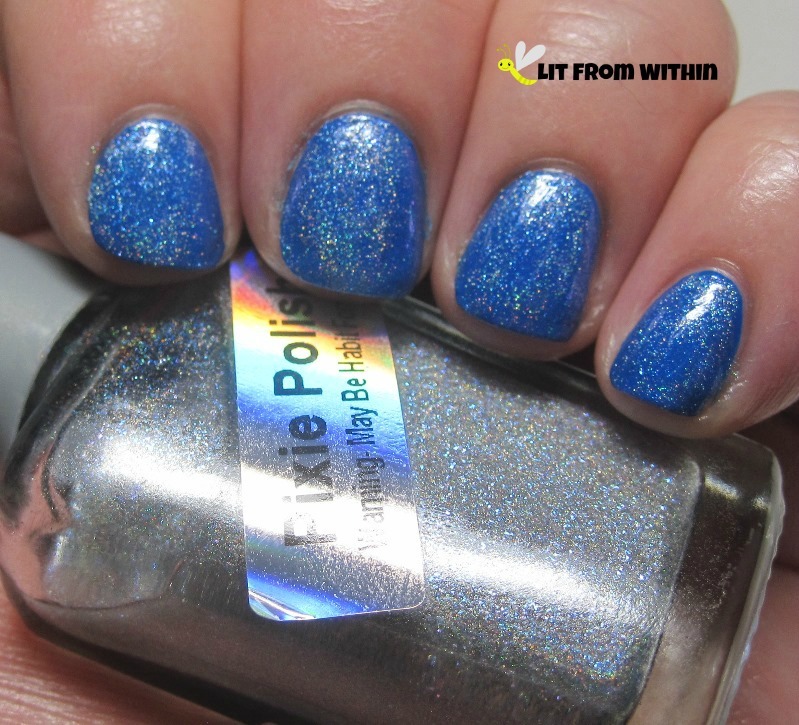 I saw a lot of blue sparks shining in this polish! If you own this, you know that the glitter settles really quickly. I don't think it's formulated with a glitter suspension base. No matter, it distributes really well with a few shakes into glittery goodness. Because I like to stick random things on my nails. 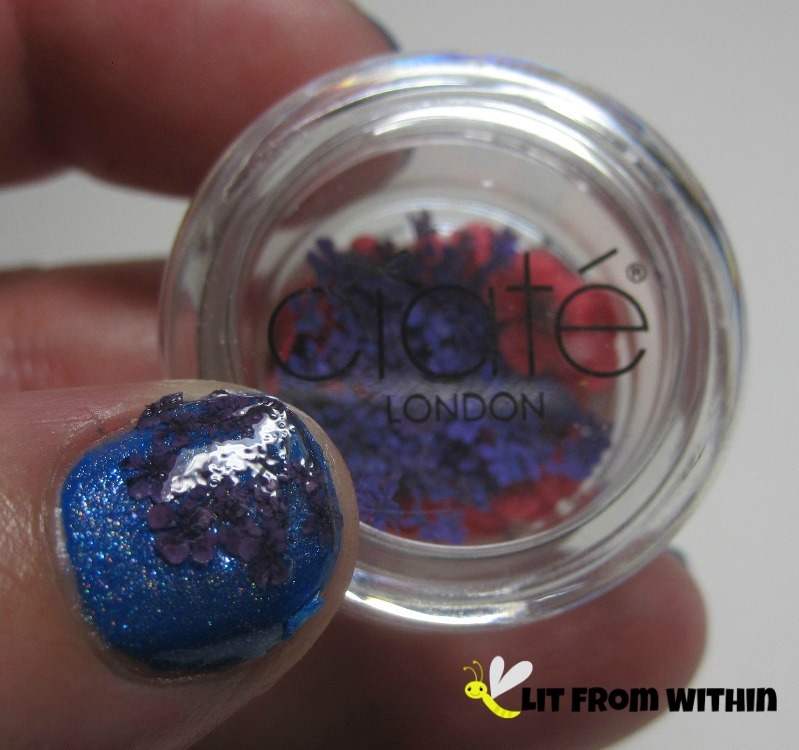 I ordered a Ciate dried flower kit from Hautelook, and decided to try the purple flowers with this mani. I actually liked how it looked, but I couldn't get the stems to lie flat, so I ended up picking it off. 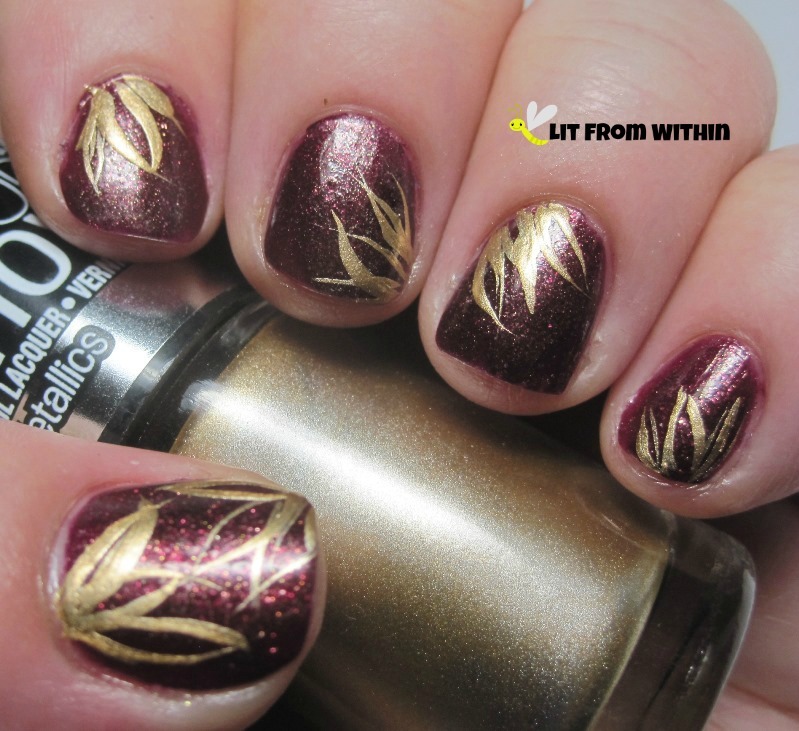 Sticking dried flowers to my nails sounds pretty strange. Somehow, when you pay a prestige company some money for the tools to do it, it seems somehow more normal... Any strange trends you've tried because you bought a kit? 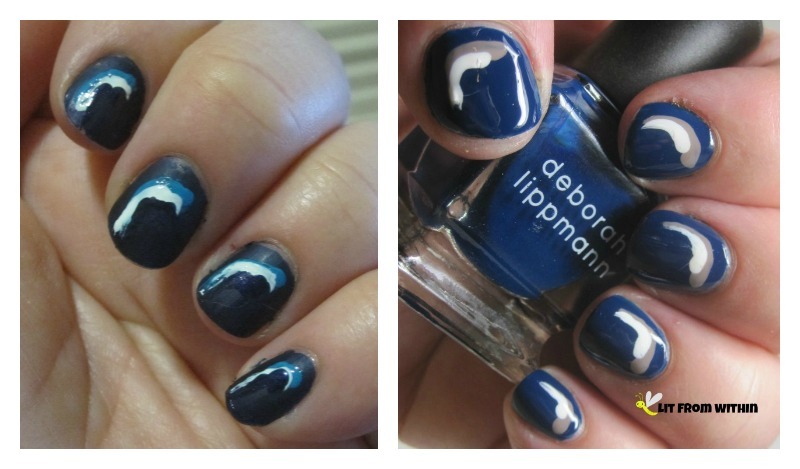 Nail Challenge Collaborative - Redo the Swoosh! 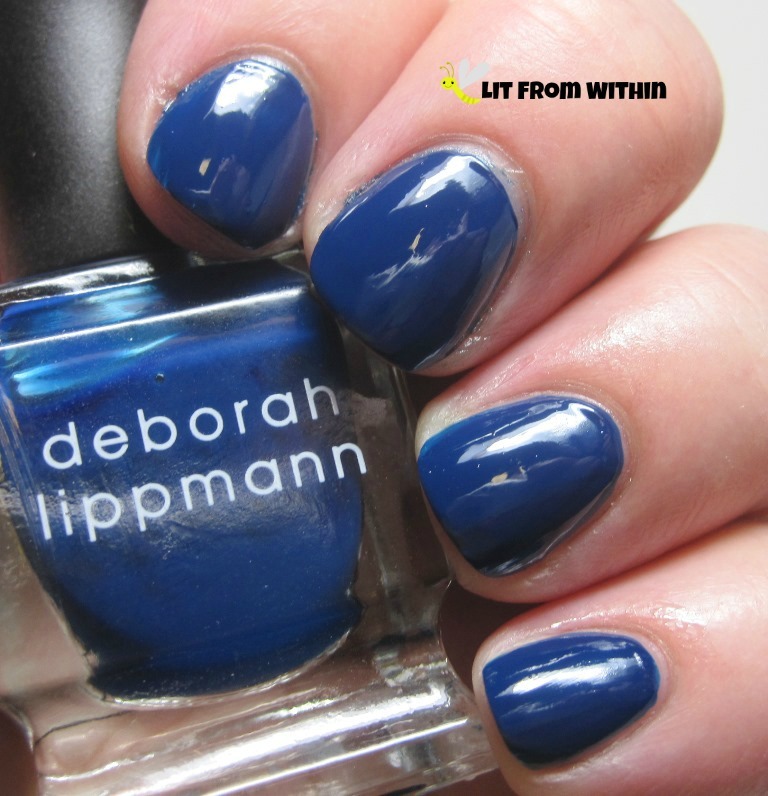 I decided to stay with blue, but going instead for a shiny cobalt version with Deborah Lippmann My Prerogative. 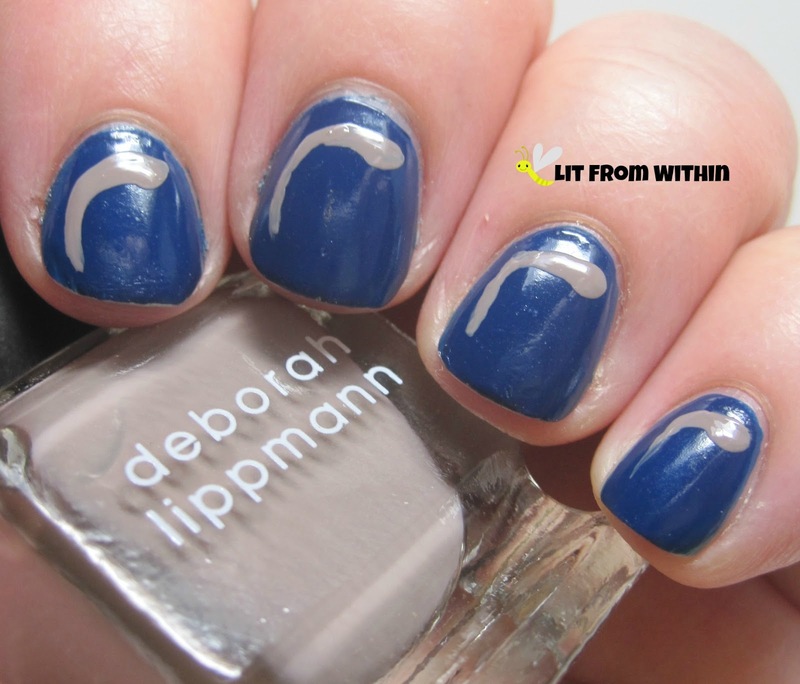 The first 'swoosh' I did with a gorgeous nudish-taupe, Deborah Lippmann Putty In Your Hands. 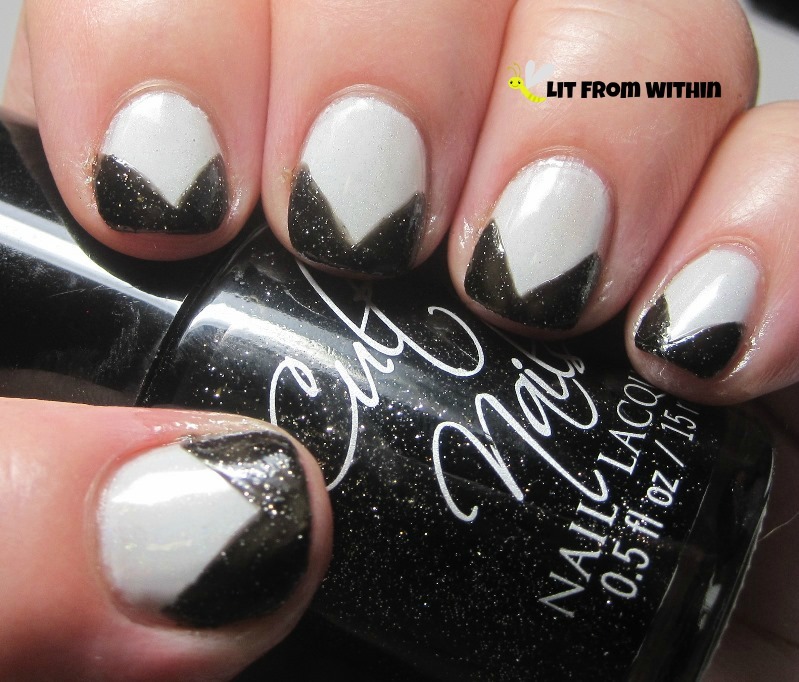 In Real Life, it looked like a negative space mani almost - the taupe was so skin-like! It was cool. 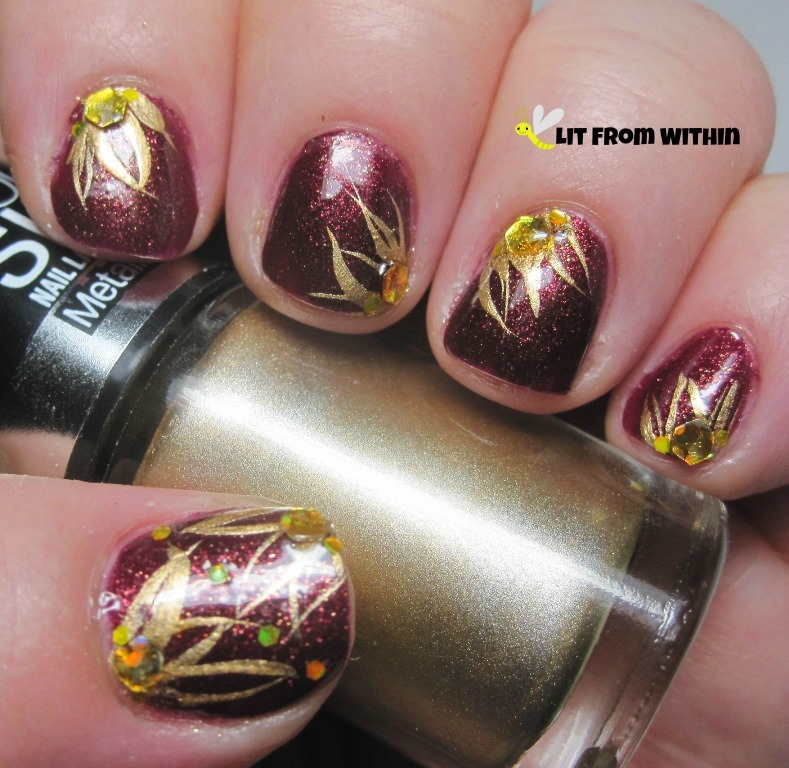 I made a little higlight 'swoosh' with Revlon Spirit. 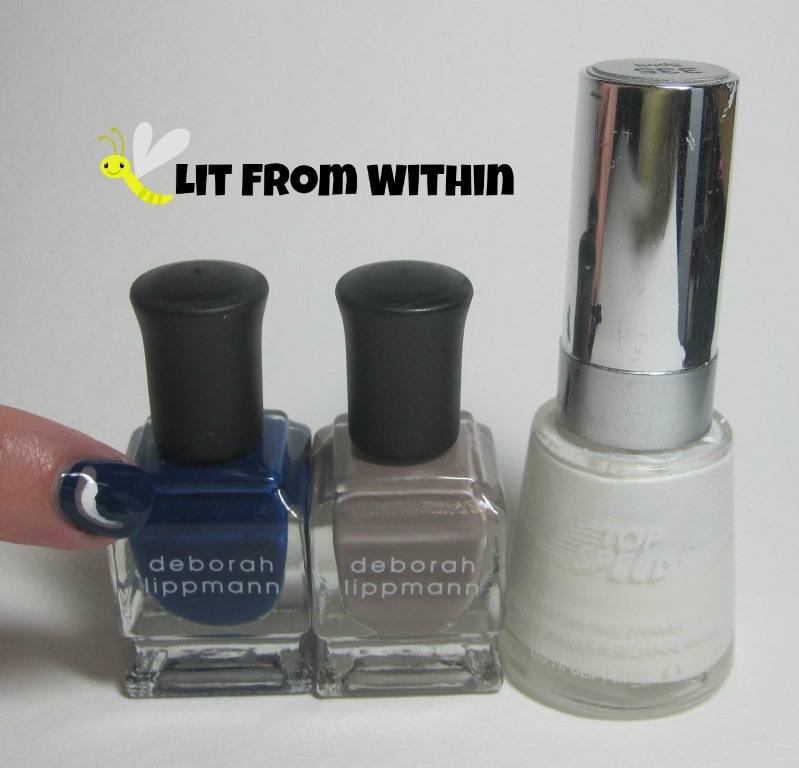 Bottle shot: Deborah Lippmann My Prerogative, Putty In Your Hands Revlon Spirit. It's a simple design, but I *still* can't get it to look like it does in my head, with the perfect flip at the end. Still, I think the new version looks pretty good, and I liked it. I hope you've enjoyed this month's theme. 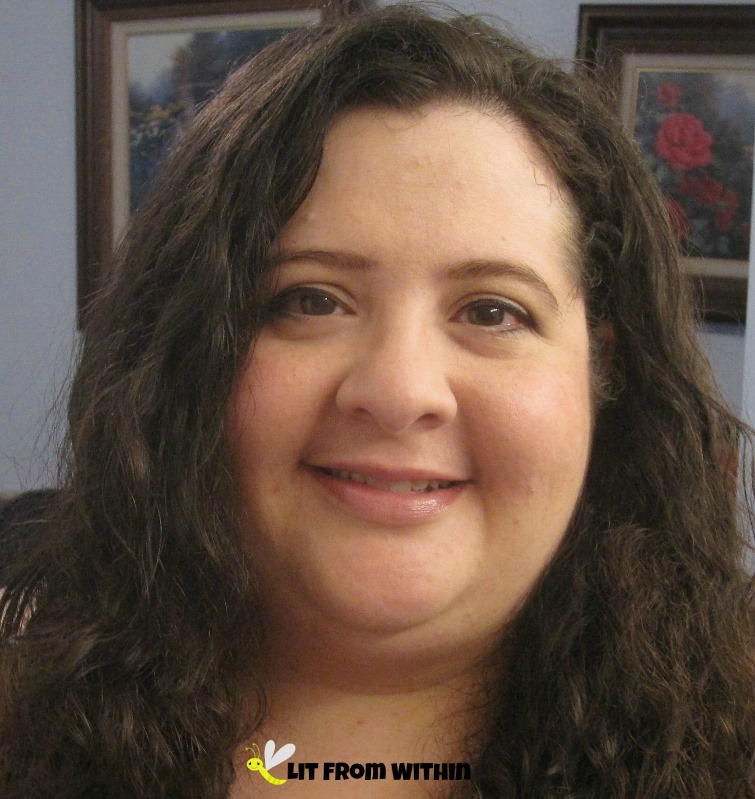 If you decide to go back into your pictures and re-do something - whether it be nail art, a makeup look, or even a hairdo or fashion look, I'd love to see your before/afters! Feel free to post them on my Facebook wall. Jupiter Ascending.. and on Fire! 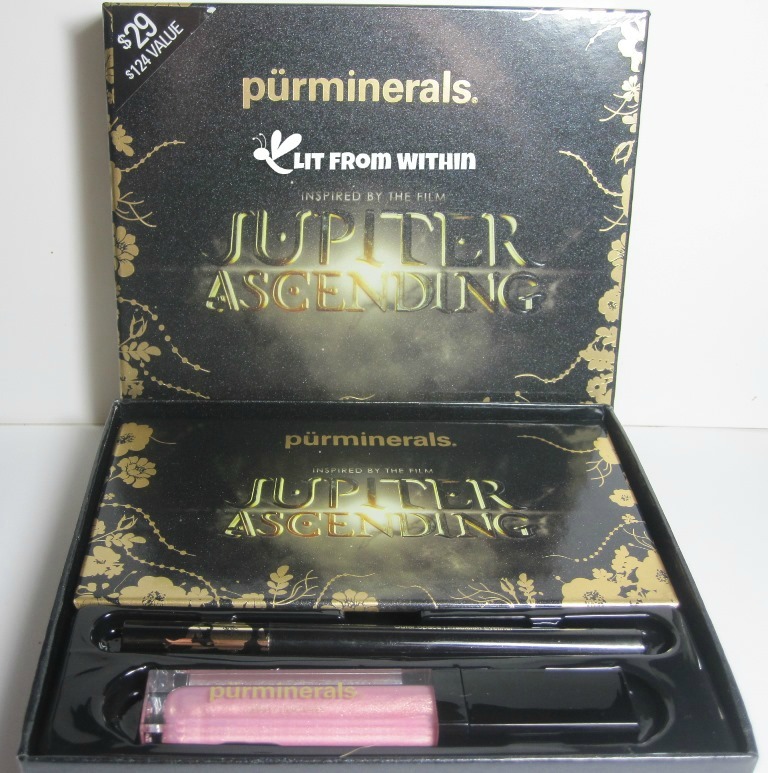 When Purminerals put out this set for the movie Jupiter Ascending, I hadn't even heard of the movie. I just thought the kit was cute. 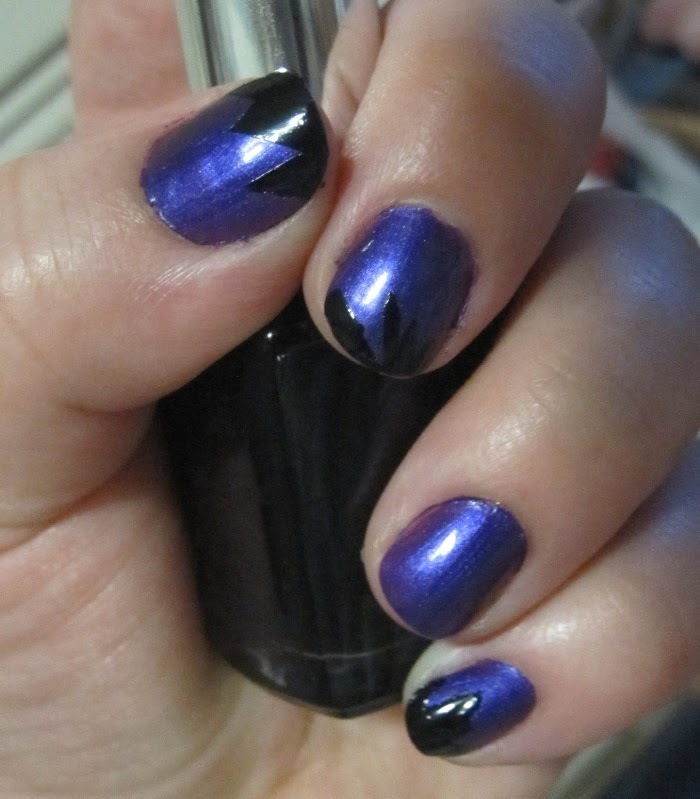 So, I put together a look to show you - and some nails I think would go with it. 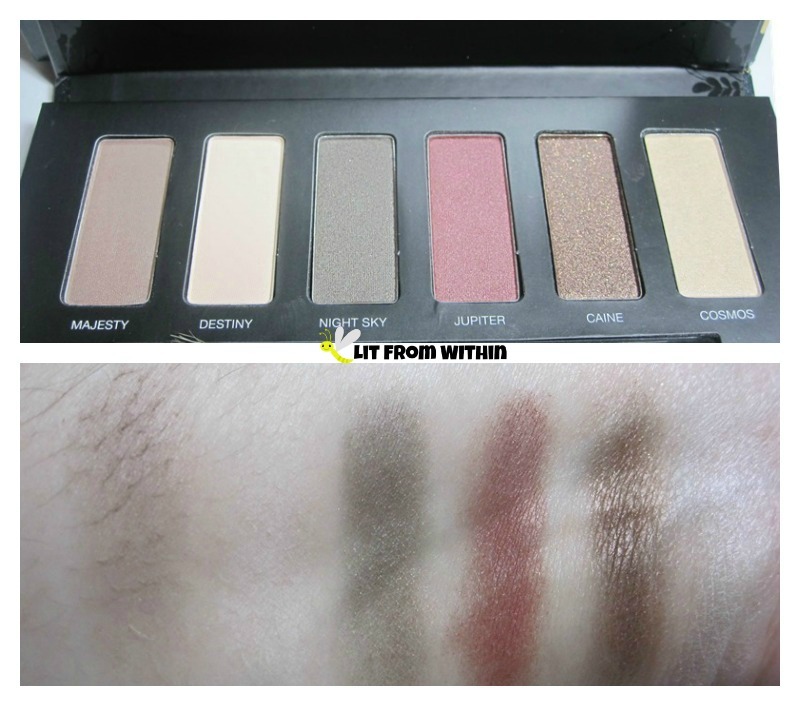 The eyeshadow palette has 6 colors, but I was mostly intrigued by Jupiter and Caine. Good thing, too, because the other shades (except Night Sky) are very light. Majesty and Destiny were a little harder, too, and difficult to get much color from. The other two things that came in the kit were the black liquid Outer Space Precision liner, and the light pink, iridescent Galaxy Lipgloss. 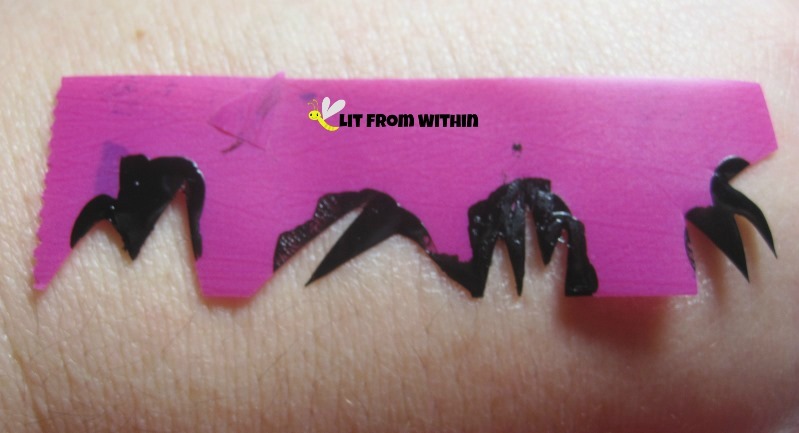 The liner is gorgeous, deep black. The lippie has great packaging with a mirror on the side and an applicator that lights up when you remove it from the base. The color is so light on me, though. I may try layering it, though. This classic neutral look really pops with that eyeliner! I believe I did use Destiny and Majesty for the lid, and they did show up a little better on my eye over primer than on my arm. I'm pretty sure I used Night Sky as a transition and Caine to deepen the outer V.
My eyes were irritated from the day before. You should have seen what I looked like *before* makeup! haha. I wish I had written down what I used to make the rest of this look! Bad blogger. 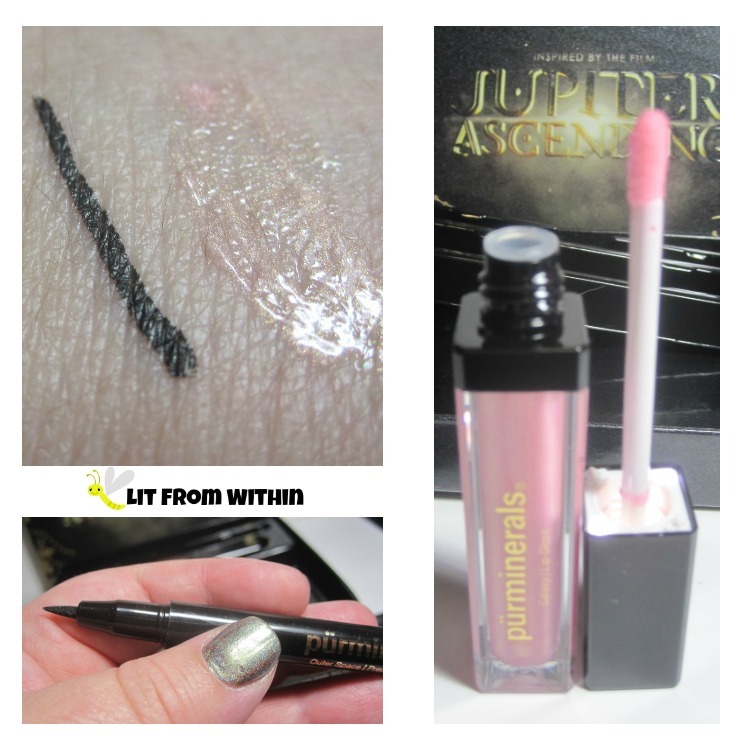 I did use the Purminerals Galaxy lipgloss. And I had just done my hair with the Kimble Beauty hair masque! Feels like a no-makeup makeup look almost! 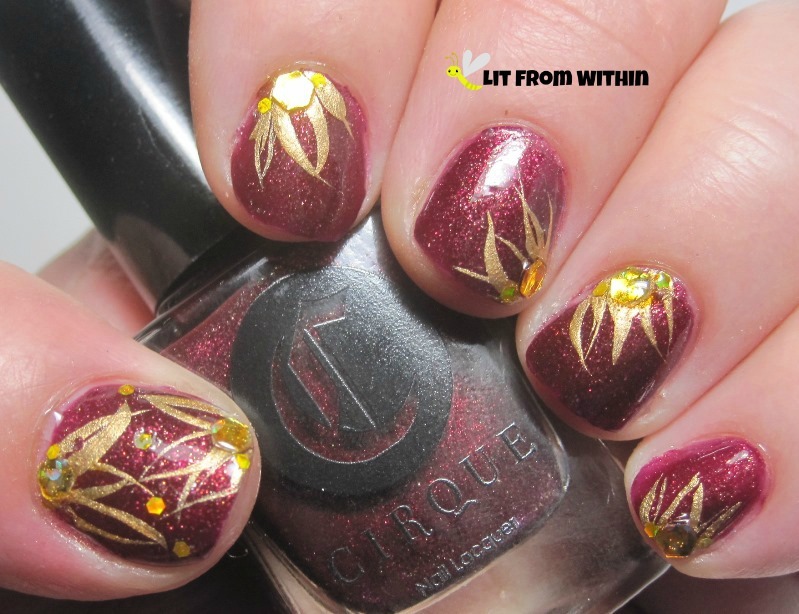 I paired this simple, light makeup look with a juicy raspberry and gold nail art inspired by @naildecor. I started with Cirque Colors Arcane Fire, a raspberry pink with flecks. I used a striper brush to apply Maybelline Bold Gold. I had two sizes of gold glitter pieces from Dollar store finds. I put the larger piece in the center, and flanked it with smaller gold hexes. The only thing I know about the Jupiter Ascending movie is that it stars Channing Tatum. Does this makeup set make you Channing all over your Tatum? 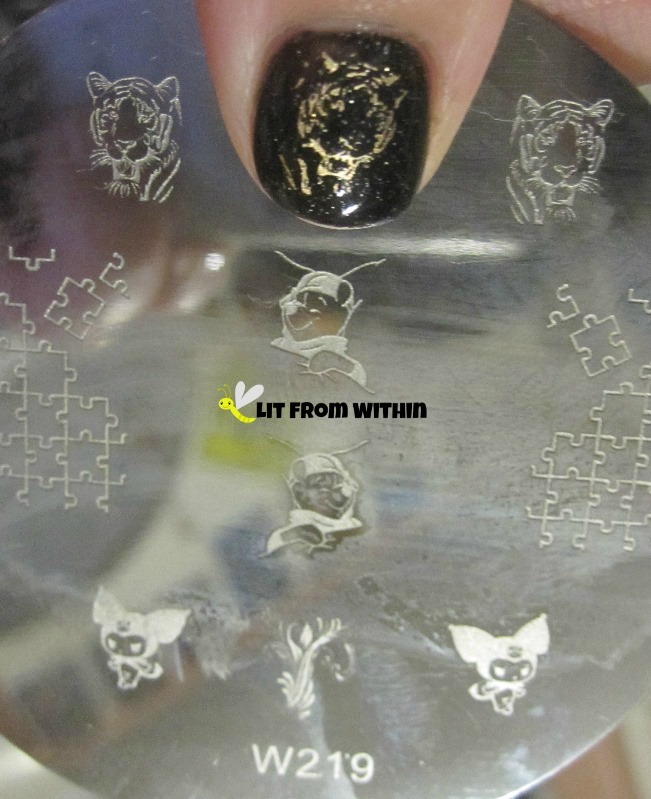 What about the nail art? Surely that title is a typo, right? I meant July? I should, but no. These are June's boxes. Sigh. Thirty lashes with a wet noodle for me for being so late with these. Today's stamping challenge was to pay homage to Global Tiger Day. Who doesn't love a tiger? Besides the tigers' food, I guess. 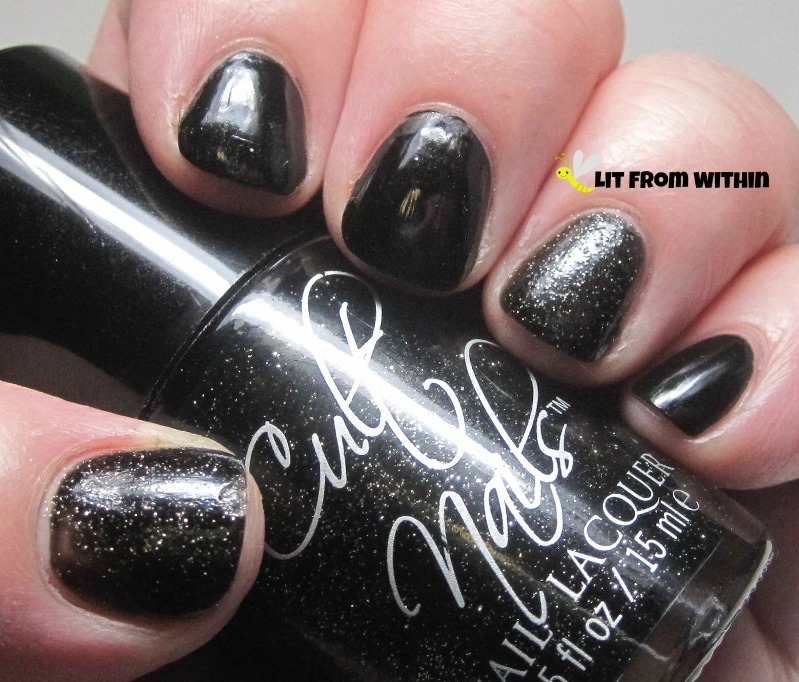 I started with Wet 'n Wild Black Creme and accents of Cult Nails Ignite, a black jelly with silver sparkles. Over the black, I layered SpaRitual Invention, a shimmer infused with recyled glass. I had hoped it would look more bronze, but instead it took on a green cast. Still cool. 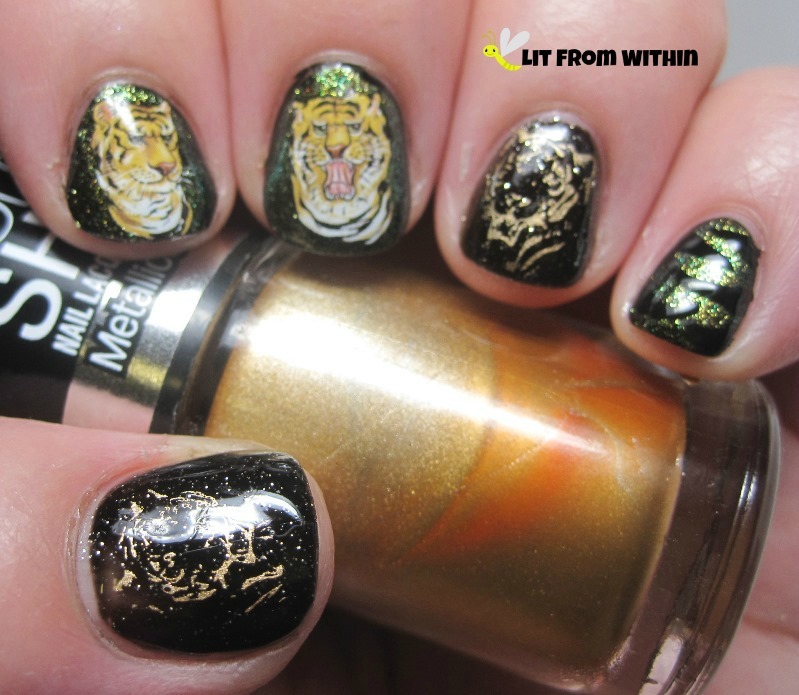 I used Maybelline Bold Gold and Anna's Nail Art plate W219 for the tigers. 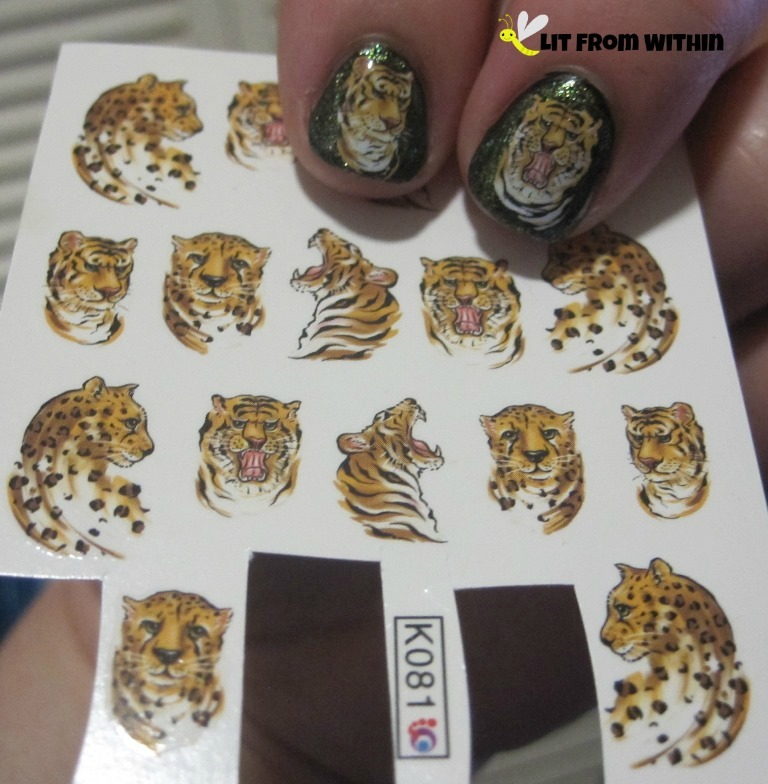 I got these tiger water decals from KKCenterHK. I also used them in this look HERE. My camera had a hard time with the sparklies. 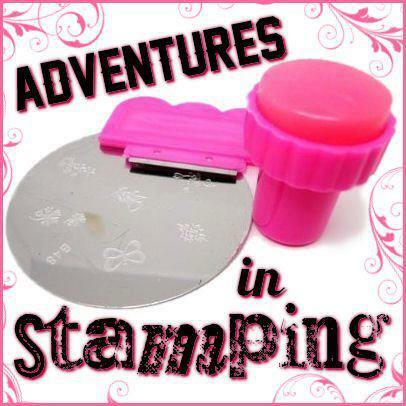 I really loved the combination of the water decals with the stamps. 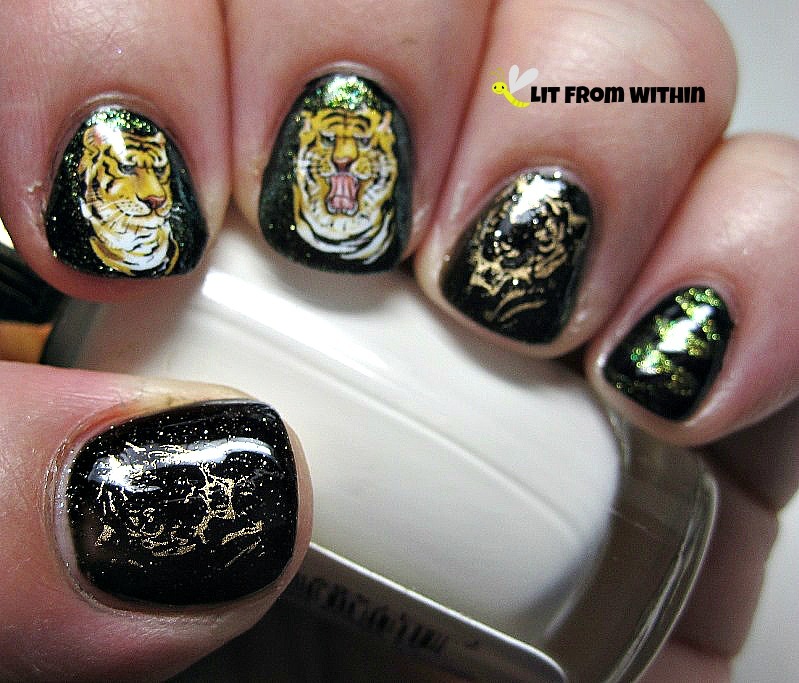 The stamps look like tiger constellations over the sparkly background! 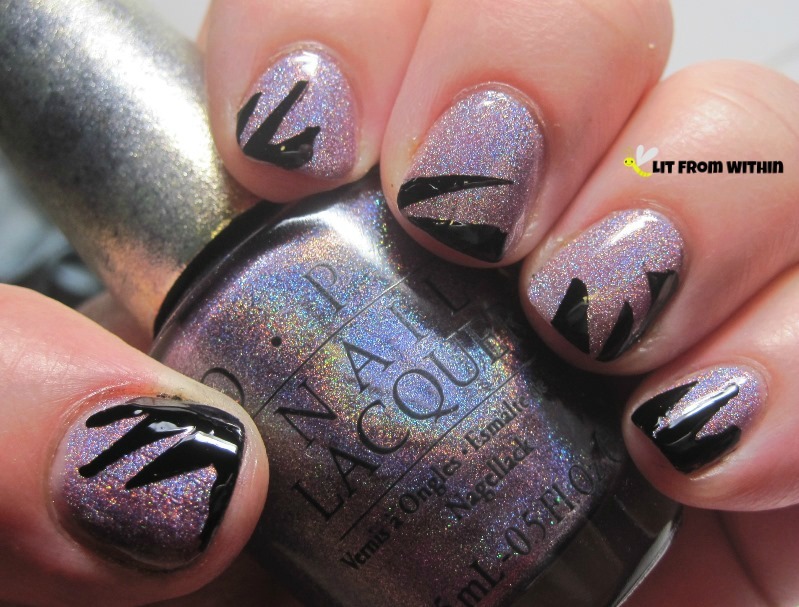 I used a black striper on my pinky to make the tiger stripes. 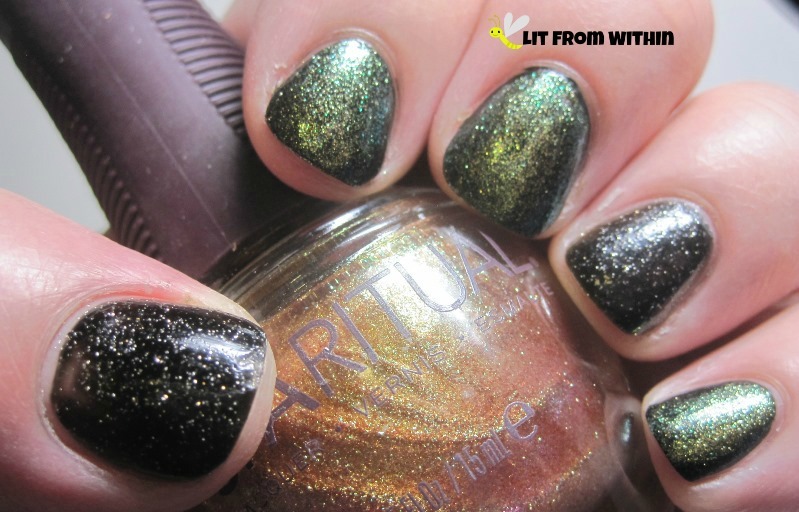 That green/gold shimmer is very jungle cat! 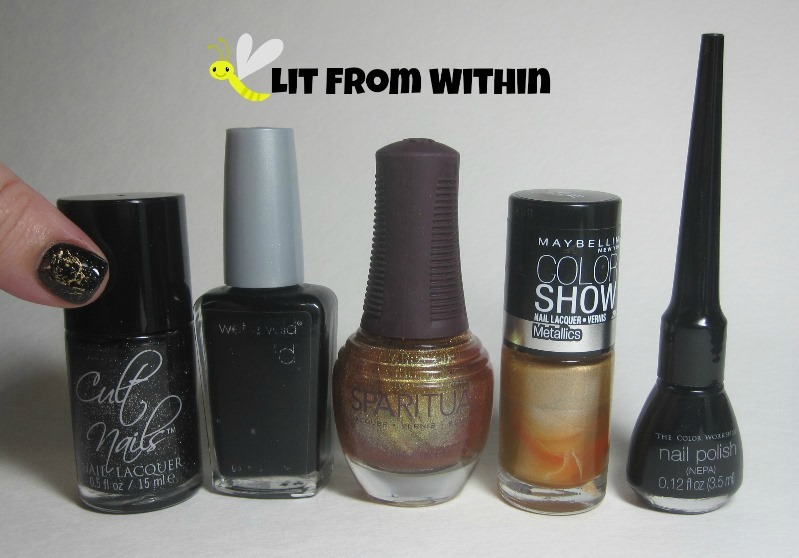 Bottle shot: Cult Nails Ignite, Wet 'n Wild Black, SpaRitual Invention, Maybelline Bold Gold, and a black nail art striper. Are you celebrating Global Tiger Day? Time for another round of Undies and Glitter! Today's polishes are some kind of blue.. mostly. 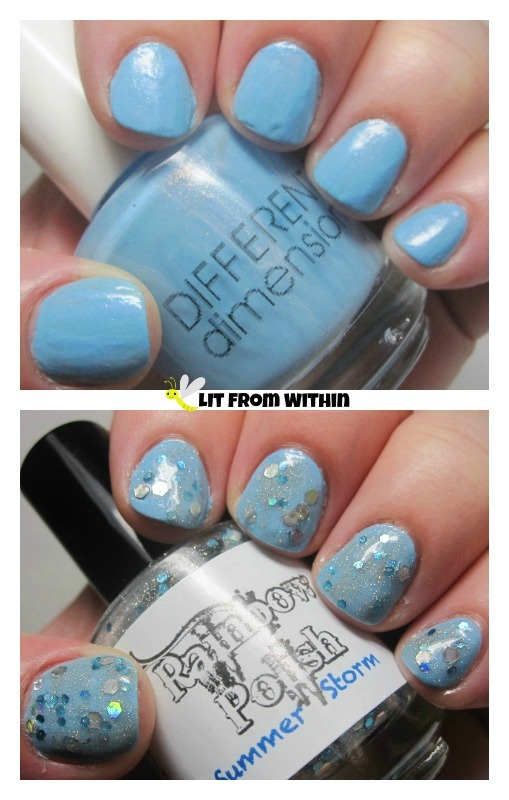 First up, Different Dimension Dewing It Right and Rainbow Polish Summer Storm. I love blue and grey together. Notice the water theme here? 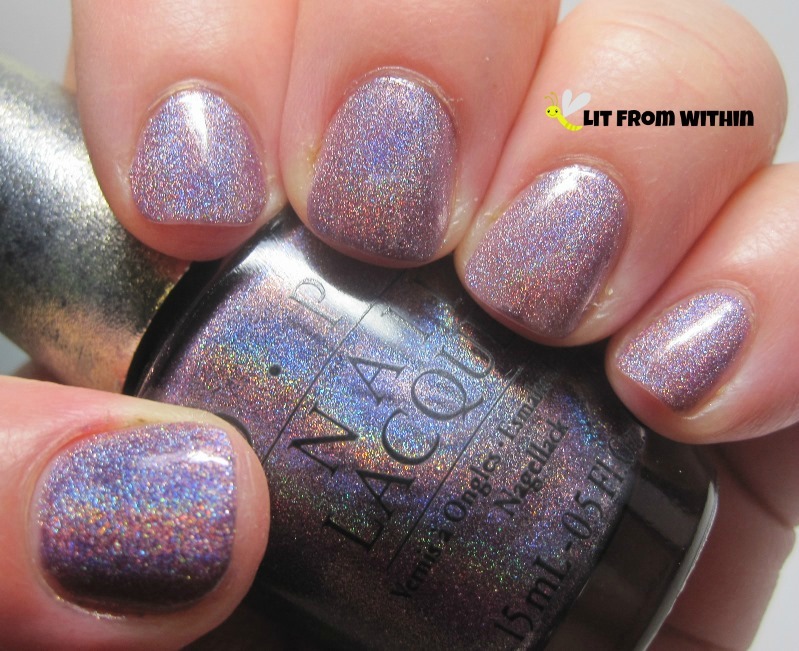 Gorgeous though it is, OPI Amazon..Amazoff is a bit of a stainer on me. I did a couple of accent nails with Shimmer Polish Cristina, which could build to opacity, as many of Shimmer's microglitter polishes do, if you like. 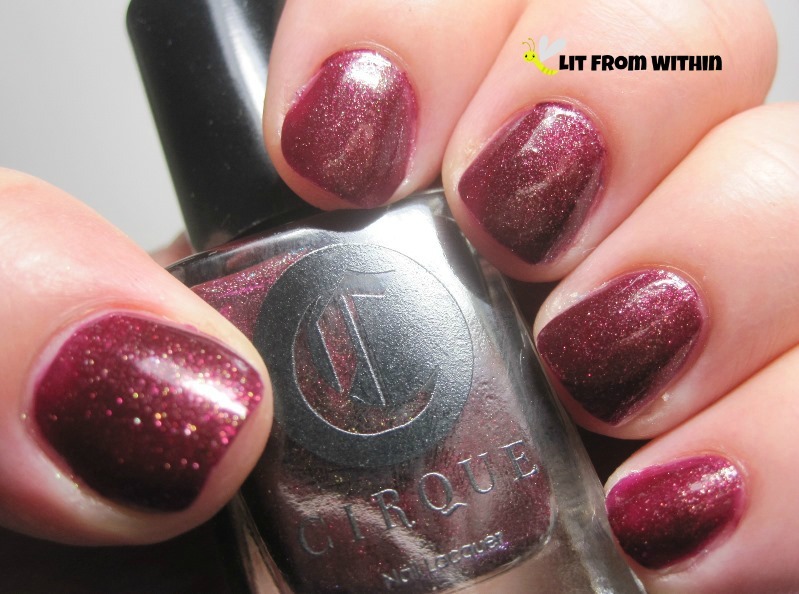 A while back, I did a post about trying to recreate a pinned look that claimed to have been made with OPI Cuckoo For This Color and Essie Shine of The Times. When I did it, I couldn't make it look like the picture. Imagine my delight when this combination actually looked like it! 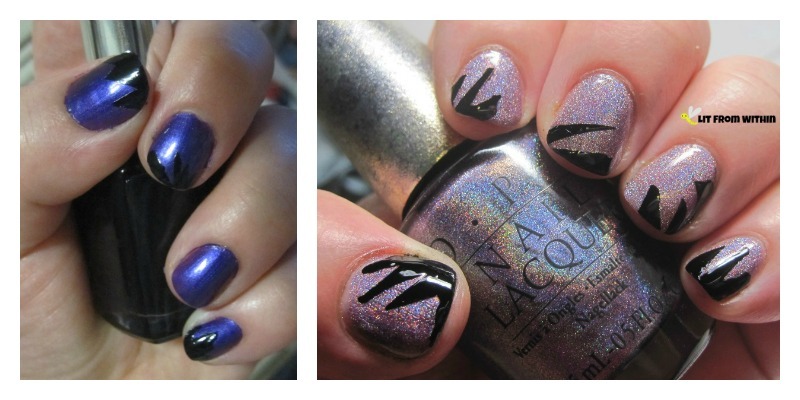 I give you OPI Amazon..Amazoff and Color Club Galactic Garden! 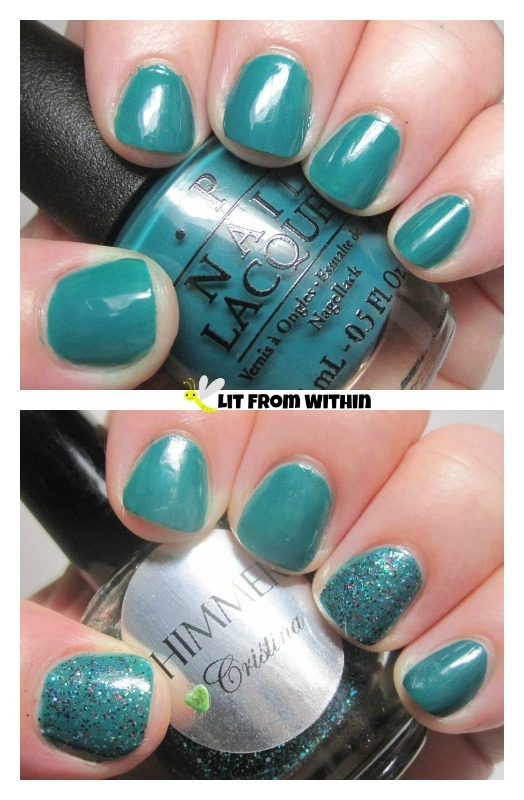 I loved the sparkle that Finger Paints You Yacht To Know Better had in the bottle, but it's so subtle on the nail. So I added Finger Paints Sparkle In The Sky. I didn't realize that it's a texture and completely opaque on its own! Instead of boosting Yacht, it obliterated it. Still pretty, though. 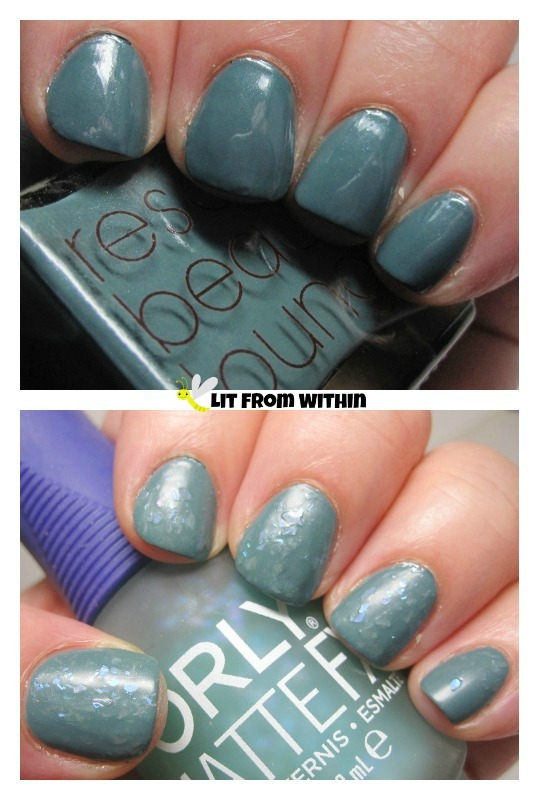 I love dusty colors like Rescue Beauty Lounge 360. I'm not sure I did it any favors by putting a matte flakie over it like Orly Green Flakie Topcoat. My heart still sings over the combination of Amazon..Amazoff and Galactic Garden. Any fave glitter combos for you? 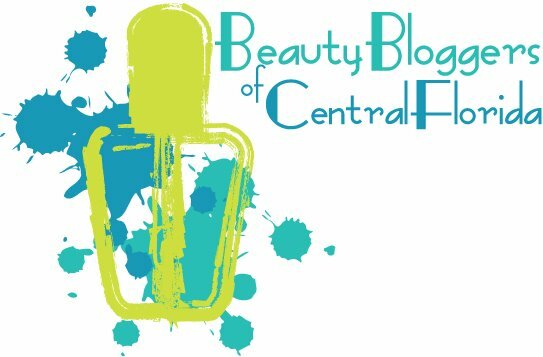 Beauty Bloggers of Central Florida Black and White Linkup! 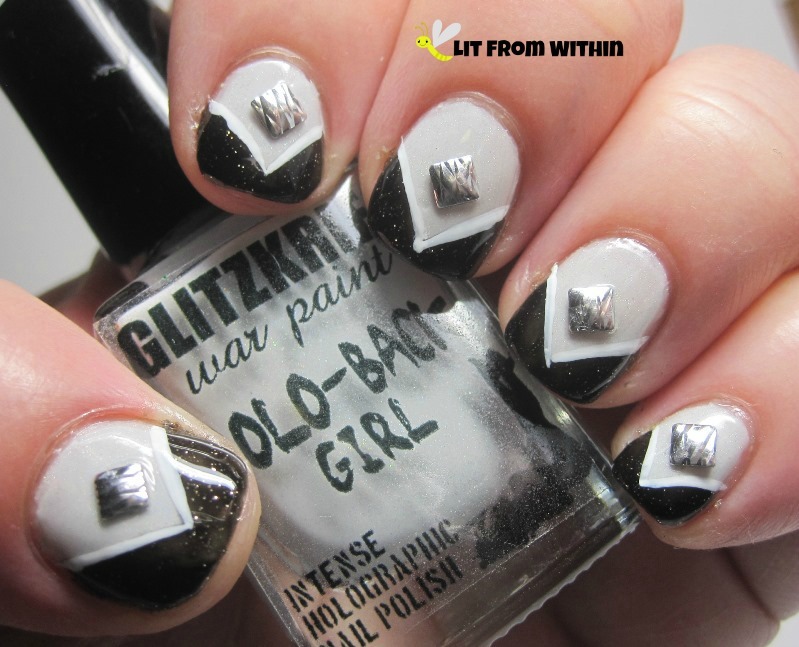 I have a special place in my heart for black & white manicures. There's something so clean and striking about them. 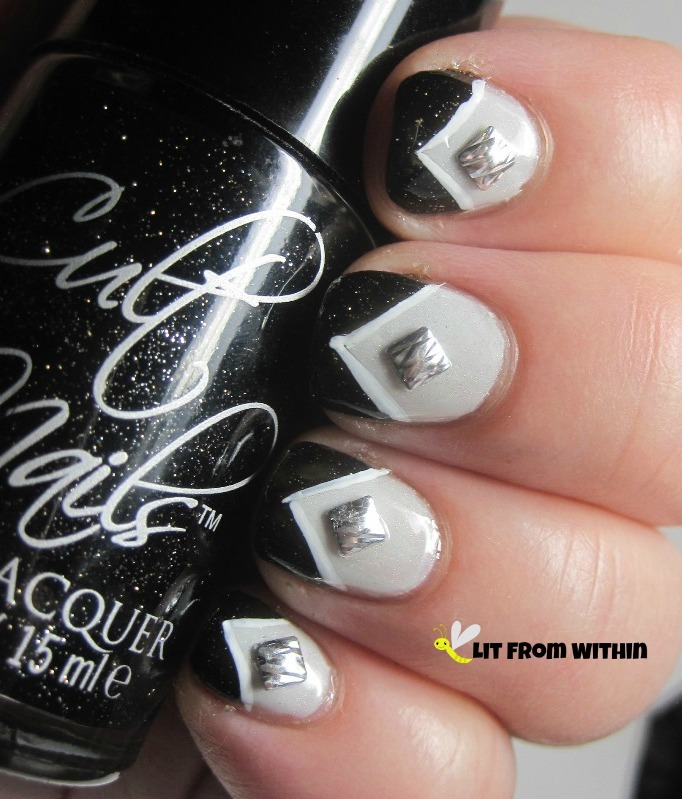 So when the Beauty Bloggers of Central Florida suggested a Black & White roundup, I was excited. I started with a new-to-me Indie, Glitzkrieg War Paint. This off-white/dove grey with a subtle holo is called Purity. I used Cult Nails Ignite to freehand a chevron tip. This is an interestingly textured polish - the black is very jelly, but is opaque in two coats. 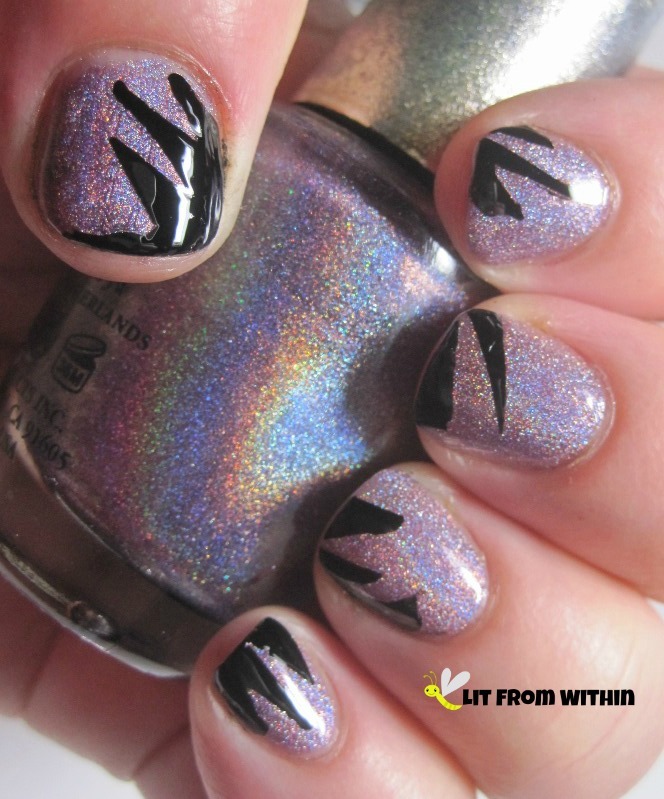 It really allows the tiny silver sparkles to shine through! Removal wasn't hard, either. The black polish comes off first, leaving a smattering of silver, but they just wiped off with a little pressure and a felt pad. No scrubbing required. A white striper helped clean up the lines and give a little contrast, and then a textured square silver stud finishes the look! All the points actually help visually elongate my nubbins. Science! 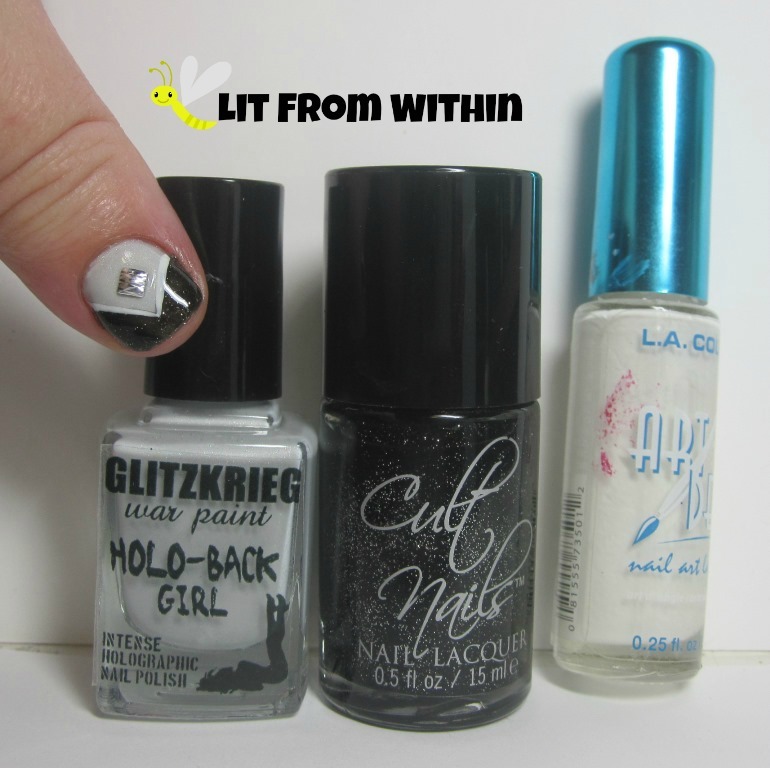 Bottle shot: Glitzkrieg War Paint Purity, Cult Nails Ignite, and a white striper. 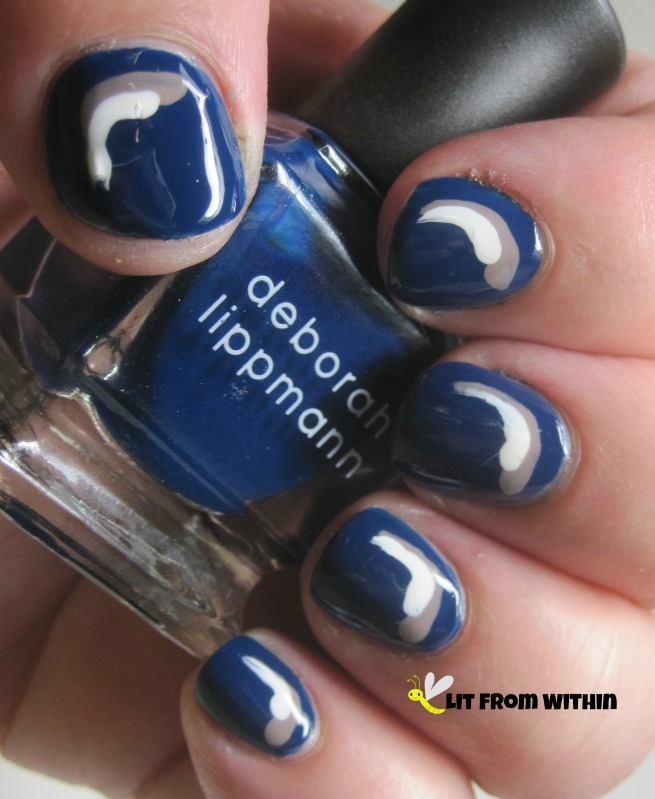 I love wearing black and white nails and outfits, and want to experiment with black and white makeup looks, too. How do you like your black and white? 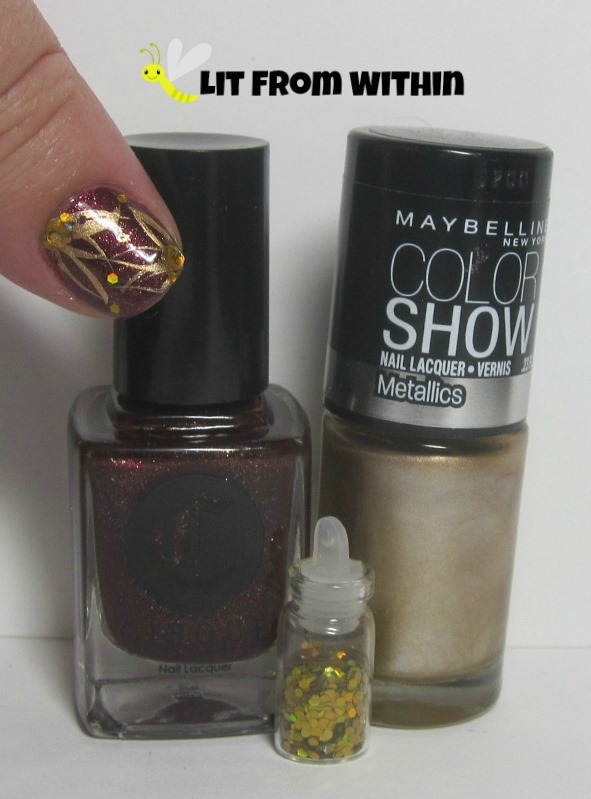 I'm updating one of my first recorded nail art looks, but using a Golden Oldie holo to do it! This original is A England Avalon.. and maybe Camelot. 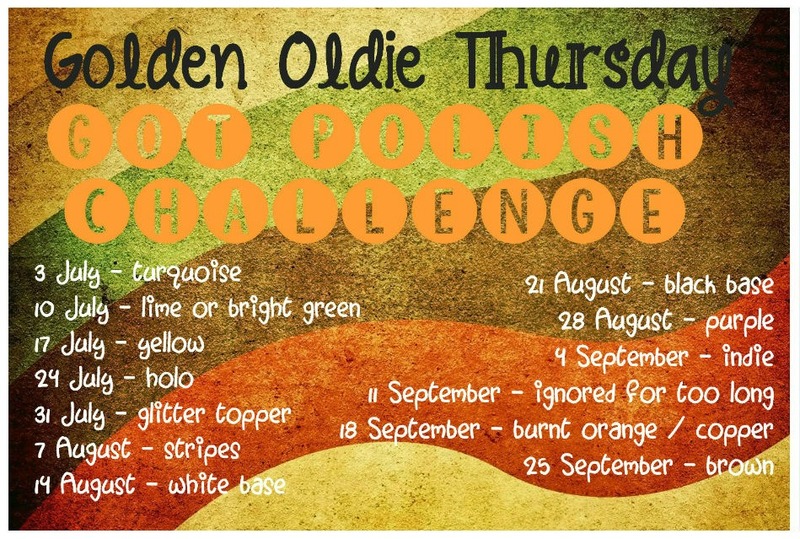 A England polishes are what sucked me into the online world of polish! 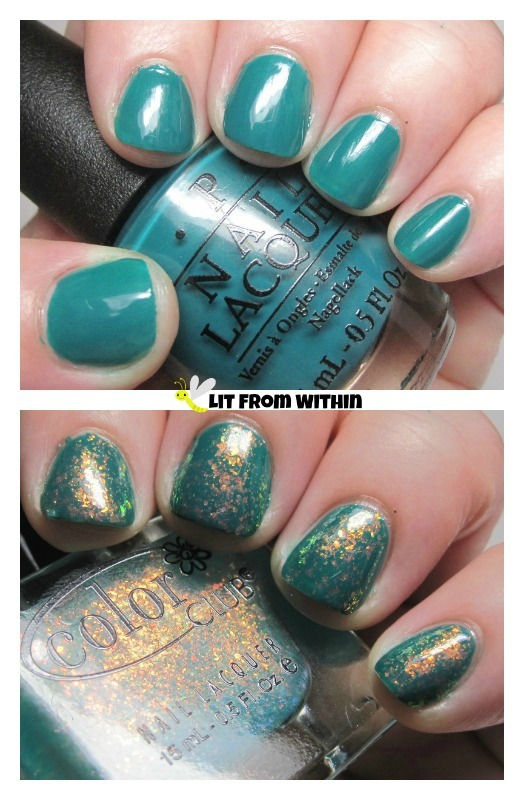 I didn't get into polish when it was still easy to get the OPI DS holos, but I have managed to collect a few in the after market. 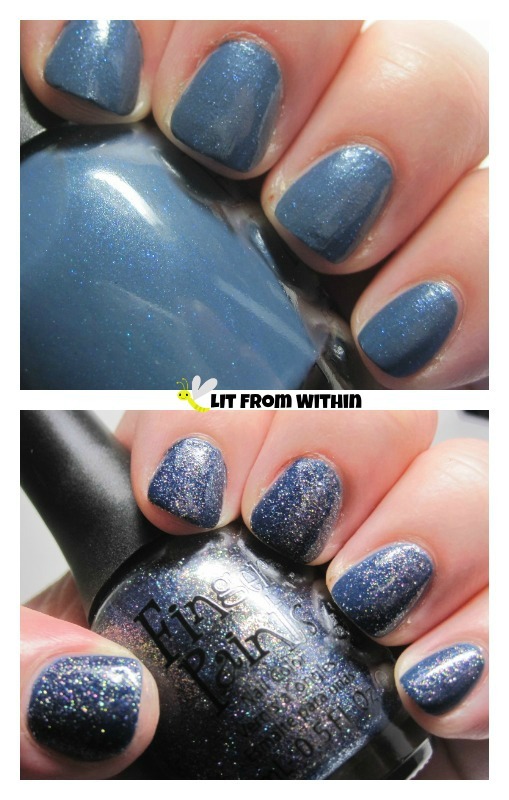 I lusted after OPI DS Original for a while, and was so happy when I got it. Ah, OPI DS Original. You are so pretty. But you stink to high heaven. 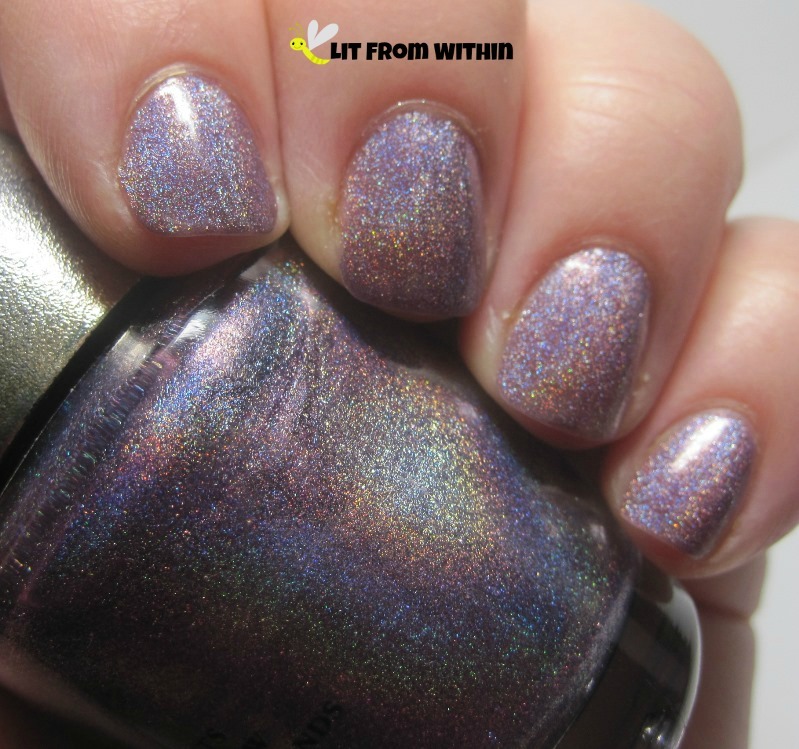 That old formula is probably why OPI hasn't redone these amazing holos. Pee-ew! I discovered this tape in the clearance scrapbooking stuff at Target. I don't think it's Washi tape. It's got a rubbery feel to it, and is thicker than clear tape. 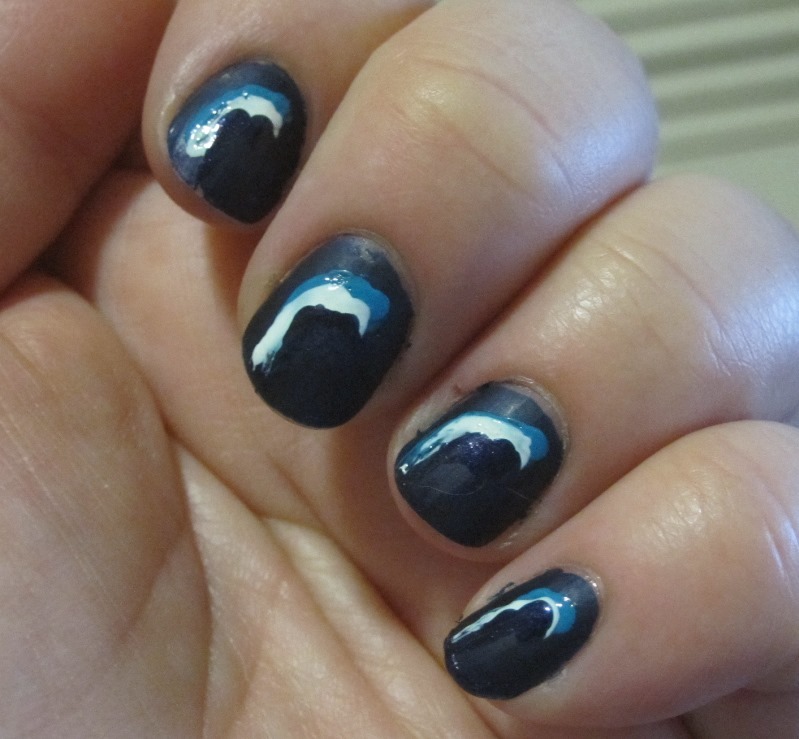 I find it works really well for tape manis. 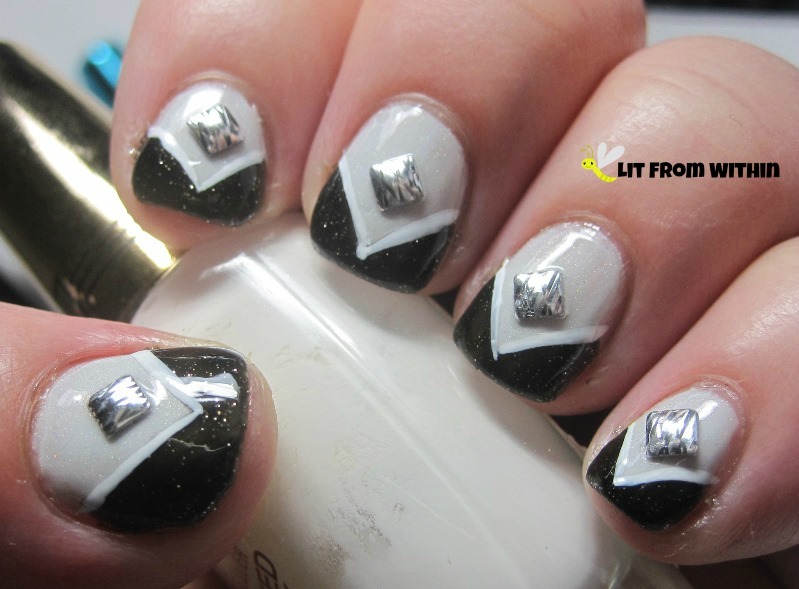 I took cuticle scissors and cut a few different spiky patterns in the tape, applied it to one nail at a time, and painted over the nail with black. Don't wait too long to remove the tape, or all of the polish will come off. Also, it's helpful to stick the tape to your hand first to remove some of the stickiness. You don't want the tape to pull off the base color. I love that you can create any kind of spiky look with tape and scissors! 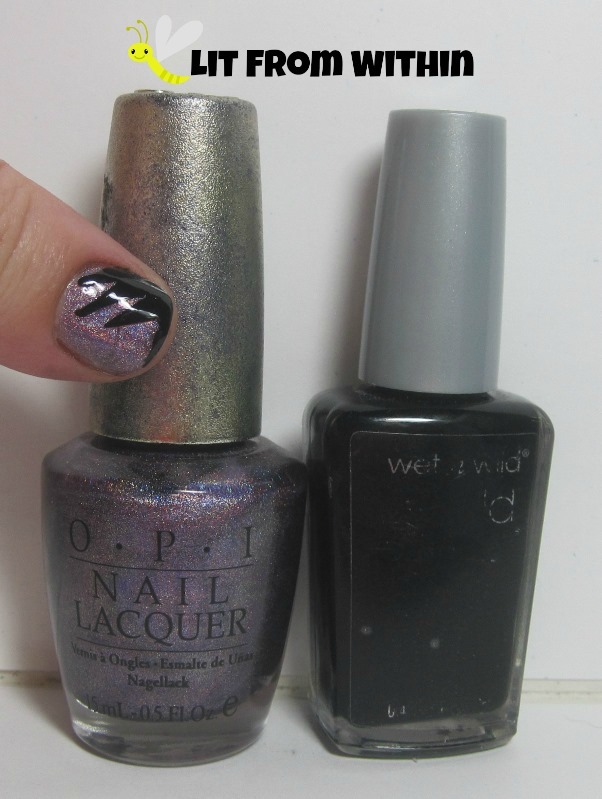 Bottle shot: OPI DS Original, and Wet 'n Wild Black Creme. TRI a little Laser Light Show! Glitter can change the WORLD! Embracing My Geekness - Looney Tunes! 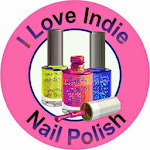 Are Nail UV Lamps Safe? I GOT Cuckoo For This Scene-Stealing Water Lily!